I watched the whole thing and the entire time I was waiting for a punch line or something funny. I didn’t think it was for real. Some quick research with Google seems to prove that this is a legit attempt by Microsoft to promote Windows 7. Who in their right mind is so excited about Windows 7 that they are going to throw a party with Windows 7 as the “honored guest”? This is a new low in their advertising campaign. I thought the “I’m a PC” thing was stretching it. Someone where I work has a baseball cap in their cubicle that says “I’m a PC” on it and every time I see it I want to tape a piece of paper over PC that says “DORK!”. After having just purchased a new iPod Touch and loving how well the device functions I think I might just finally ditch Windows all together and move to Mac. I’ve always enjoyed watching the keynote addresses from Apple and their marketing is sooooo much better. Apple has their act together when it comes to pitching a product that actually works. My wife has a Mac so I think I’ll start using that. I remember the Vista launch…or failure to launch. I kind of get the feeling that the Windows 7 launch won’t really make it off the launch platform either. Don’t get me wrong, I’ve been using Windows 7 since the beta version and I’ve been pleased with it. Windows 7 is a lot better than Vista if you ask me. And when I say “a lot better” I don’t mean that it adds a bunch of new stuff, I mean that it actually seems to work. I think MS is trying too hard to pitch to a market that has lost faith in them. I also think that the marketing people have been locked up and away from society too long and have geeked out too much on MS that they fail to see how really lame these ads are. It’s kind of funny how such poor advertising alone can make me want to switch to Mac. Good luck MS. You’re going to need it. I’ve had the desire to get an iPhone since I first saw one, but I tried AT&T once and their service was terrible. Since the iPhone first came out there have been a lot of cool improvements and it’s nice to see that Apple appears to listen to it’s consumers (unlike some other companies out there <cough>Microsoft<cough> ;-)). So, with that said and the release of the new iPods, I finally figured I’d try to satisfy my iPhone cravings somewhat by getting a new iPod touch. So far it has done little to satisfy my cravings and has only increased my desire to own an iPhone. The new iPod Touch rocks!!! Currently I have a Samsung Omnia on Verizon’s network. It’s the fourth Windows Mobile phone I’ve owned and the best of the lot. I have WisBar Advance Desktop (WAD) installed (and a lot of other stuff ) to allow me to customize it so that it’s a little more usable. I really like WAD and I think it does a lot to make the phone more usable. However, even with WAD it’s still somewhat clunky and not very finger friendly. Then along comes Apple. I don’t remember my first encounter with an iPhone, but my brother got one and I remember playing with it and thought it was pretty cool. I wasn’t sure about the on screen keyboard though. I then had to configure a bunch of them for work and got to play around with them more and really started to like them (especially compared with Blackberries, which are an enterprise nightmare if you ask me). 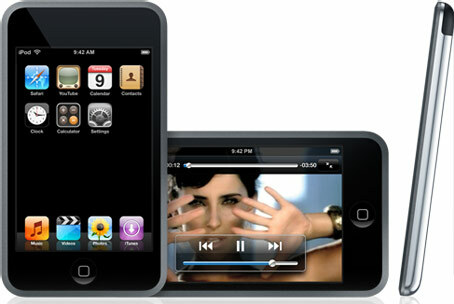 Then along came the iPod Touch. I’ve spent some time on those as well and as I mentioned above I finally broke down and bought one. I’m not disappointed one bit. As a matter of fact, I’ve fallen even more in love with it. Apple just seems to have gotten it “right” (notice I didn’t say perfect 😉 …yet). Email looks like it should when you view it. No more text only emails that are hard to read with pictures as attachments. HTML emails render the way they should and it’s wonderful. Web Browsing is sooooo much better. I thought Opera Mobile on the Omnia was a huge improvement over IE, but Safari on the iPod/iPhone is much, much better. Pages render quicker and more accurately. You can navigate around the page and zoom in and out much better. It’s a night and day difference. Picture browsing is much faster and more responsive. It just works. And then there are the Apps. Windows has stuff out there, but you really have to dig. The App store is hands down one of the most alluring things about the iPod/iPhone. There are thousands of Apps available that allow you to do pretty much whatever you want. And if you can’t find what you’re looking for and you’re up for it they have an awesome SDK so you can develop your own App. I admit that I haven’t used the SDK, but I would like to play around with it. I have downloaded the iPhone Application Programming series from iTunes U and will be listening to them on the train on my way to and from work. And that’s another cool thing about Apple, iTunes U. Sure, there’s a lot of that out there that you don’t need Apple for, but one of the things that I think Apple does a really good job of is bringing content to the user. They have centralized a lot in one place with the App store and iTunes so that it’s easy to get what you’re looking for. Windows Mobile has nothing that even comes close.